On arrival in Srinagar meet and assistance on arrival and transfer to hotel/ Houseboat. Afternoon 2-3 Hours Shikara ride on Dal Lake by a “SHIKARA” witness floating and vegetable gardens & experience the aquatic life of Srinagar. While returning visit to the local crafts market and see the fine carved hand-made articles from Paper Machine & wood of a walnut. Evening return to your reserved Houseboat/Hotel for dinner and overnight stay. After breakfast, Full day excursion to Gulmarg, called as “Meadow of Flowers”2730 Mts. above sea level. The distance of 56 kms will be covered in about 1 ½ hrs. Gulmarg is famous for Ski Resort & the world’s highest 18 hole Golf Course. One can also have the view of Nanga Parbhat if weather permits. The View enroute from Tangmarg to Gulmarg is fascinating. One can also have a short trek upto Khilanmarg which can be covered in about 3 to 4 hrs or enjoy a cable car ride which takes to the highest point. Evening return toSrinagar hotel / Houseboat for dinner and overnight. After early breakfast, you will visit Mughal Garden"NISHAT" (The Garden of Pleasure) built by Asif Khan brother in law of Jehangir in 1632 AD. and “SHALIMAR” (Abode of love) built by Jehangir for his wife Empress Noor Jehan. 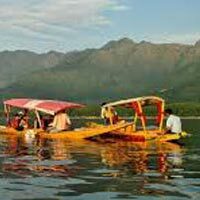 All the gardens are situated on the bank of Dal Lake with the Zabarwan Mountains in the background and straight drive to airport on time to catch onward flight.